Should you require schooling for your horse, then he can come and stay or I can visit your facilities to help. 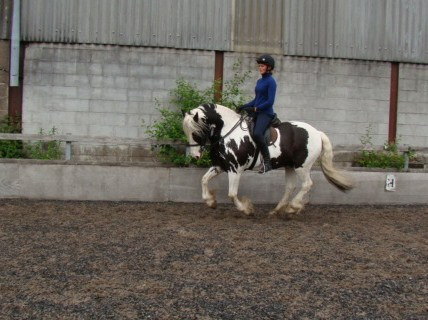 This can be for flatwork, jumping, manners, road confidence or simply brining you horse back into work. Emphasis is put on lightness and acceptance of the aids whilst the horse progresses in his balance, suppleness and ability. The aim in all my schooling is to enable the horse to be as suitable as possible for the owners’ level of equestrianism. I encourage riders to be involved so the work may continue at home. I ask that horses have had their regular dental/farrier visit and come with well fitted tack. All requirements can be discussed and solutions found.